Armstrong--Williams. At Holy Trinity Church, Jane Keiller, daughter of Mr and Mrs J. B. Williams, 105 Stout Street, to Anthony Winchester, son of Mr and Mrs G. W. Armstrong, 9 Hinaki Street. 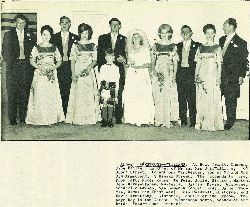 The attendants are, from left: Peter Rouse, Te Puia, Juliet Simpson, Marton, John Barns-Graham, Ruatoria, Jillian Rouse, Gisborne, Annabelle Dawson, Ngaruawahia (chief maid), David Thomas, Hicks Bay (best man), Erin Caldwell, Gisborne, and David Armstrong, Gisborne, cousin of the groom. 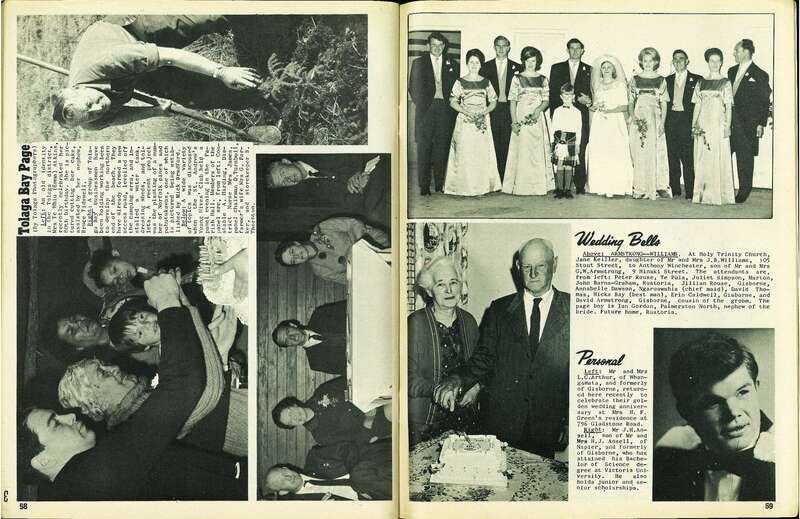 The page boy is Ian Gordon, Palmerston North, nephew of the bride. Future home, Ruatoria.